With two races to go, a slim points lead and a double points finale, Juan Pablo Montoya faces a dilemma that will make or break his title challenge. 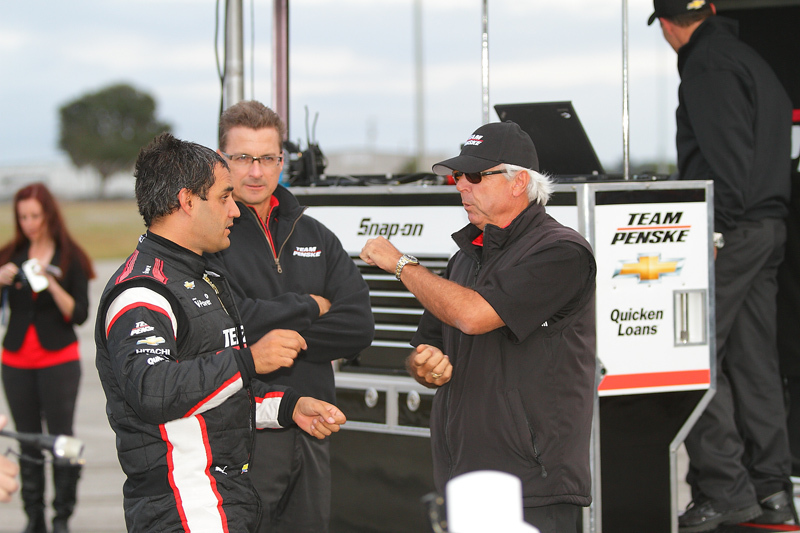 Juan Pablo Montoya with IndyCar legend Rick Mears. Comparing the IndyCar season opener in St Petersburg and the last round at Mid Ohio is a real eye opener. Five months ago Montoya was back to his best on the west Florida streets. Hustling and giving no quarter he out muscled team-mate Will Power for the win. Victory set JPM on the road to leading the standings ever since, cemented by metronomic consistency and a thrilling Indy 500 win. Fast forward to last weekend’s race and we saw a very different Montoya: burned by the timing of the final full-course yellow his last few laps were marked with hesitance and caution. Rivals capitalised leaving the Colombian in unnatural territory – playing safe and pulling his nose out of any 50/50 move. The Mid Ohio result meant the 1999 IndyCar champion’s points lead crumbled to a meagre 9. Graham Rahal has become an irresistible force in recent weeks and Scott Dixon is in his favored portion of the season. Thus Montoya faces a real dilemma: continue to play for consistency and perhaps limp over the line, or get back in his comfort zone and run full throttle? Montoya goes wheel-to-wheel with Michael Schumacher in F1. This is not to say that the Colombian has raced quietly since Indy. 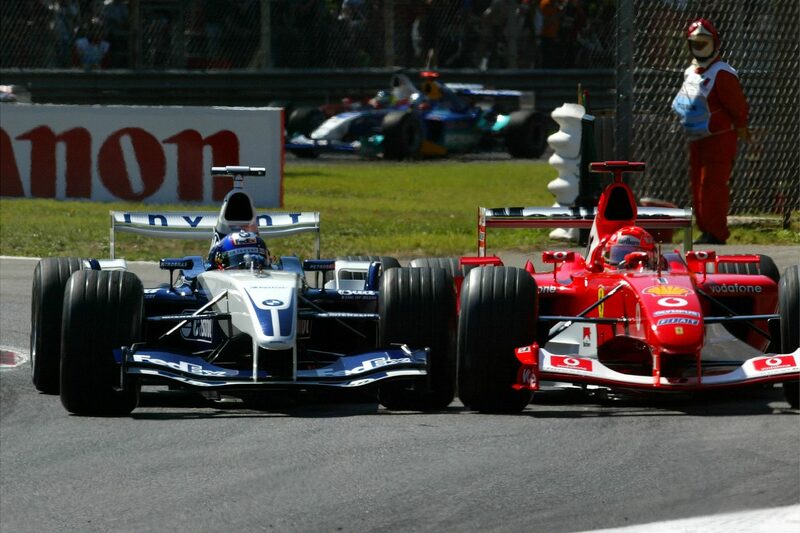 Far from it but in comparison to Montoya in his pomp – overtaking on the grass in Formula 3000, going wheel to wheel with F1’s bully of the time, Michael Schumacher or flatly refusing to be rubbed/bumped/wrecked in to submission in NASCAR – the last few races have been fairly subdued. You sense the nerves setting in at Penske also. After finally closing out a season last year, this super team looks a bit lost. Way off on set up at Milwaukee, slow when the sun set in Iowa and weak on strategy in Ohio, the signs are there. To add insult to injury, if they do lose to Rahal it will be to effectively a one-car outfit with Honda power and aero. A result unthinkable just a couple of months ago. 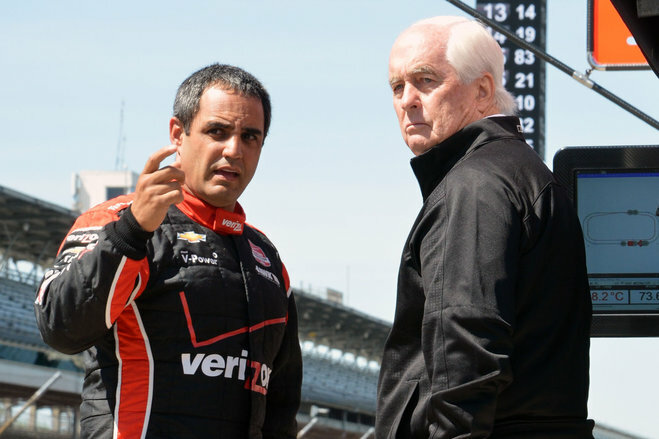 Montoya and Penske need to go aggressive for the rest of the season for one simple reason: all his rivals are. Rahal has the scent of blood and looks as if he could move cars out of the way by sheer force of will. Dixon has nothing to lose with a 34 point gap to Montoya and Rahal gaining momentum like a tidal wave. IndyCar’s penultimate round at Pocono should be good for Montoya. His win last year set in motion a series of strong results that set up his current title push started. Whilst Fontana suggested Honda had their act together that is not a circuit with many similarities to Pocono. Indianapolis is the closest comparison to the ‘Tricky Triangle’ and we know how that turned out. Then again, most of us had written off Honda after May so who knows what it might throw up. For Montoya it doesn’t really matter – he has to go back on the offensive and drive the way he knows best to win a second IndyCar title. Next Post Formula E: can all-electric help save motor sport?